Smok TFV8 RBA Coil, which is designed for Smok TFV8 tank, is suitable for DIY lovers! You will enjoy perfect vaping with this coil. Just get it as your spare part. • It is compatible with TFV8 Tank. • Quick link: TFV8 Cloud Beast Tank. Simple clamp system, better in this application than the somewhat easily bent (posts) velocity deck that came included with my Smok TFV8 Cloudbeast.Perfect fit, a nice performer.After my velocity deck bit the dust, I retired the Cloudbeast. (It did solve the issue of the smoke detector going off as I chain vaped until I couldn't touch the tank.Perhaps that was a bit too much vaping eh? )I am using the included coils and am able to impressively fog the apartment once more.This renewed my Cloudbeast perfectly.Thank you Smok and Gearbest for continuing to make these available. 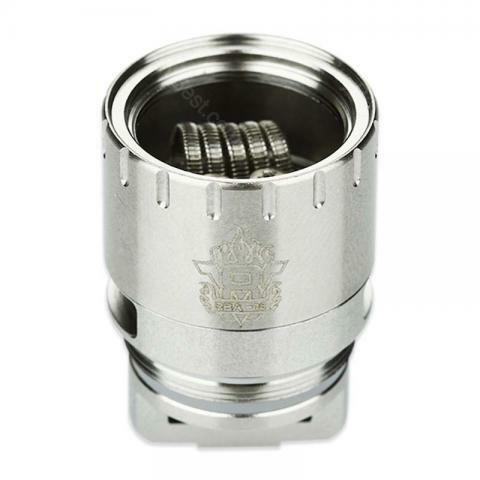 TFV8 RBA Head grants your SMOK TFV8 the ability to build your own coils. This allows you to rebuild your own coils providing great flavor and vapor adjusted to your personal preferences.